A certain oncogenic mutation starts small, altering the function of a single gene, and then acts more widely, causing disruptions that ripple outward, in three dimensions, through the genome. The ripples lap against genomic regions called topologically associated domains (TADs), where physical interactions can lead to changes in gene regulation. Ultimately, the mutation, which imparts a gain of function in the gene encoding the enhancer of zeste homolog 2 (EZH2) protein, shuts down entire chromatin domains, turning off genes that normally suppress tumors. The EZH2 mutation wavelets that propagate through the genome were tracked by Swiss scientists, who presented their findings in an article (“EZH2 oncogenic mutations drive epigenetic, transcriptional, and structural changes within chromatin domains”) that appeared January 28 in Nature Genetics. The scientists, led by Elisa Oricchio, a professor at Ecole Polytechnique Federale de Lausanne (EPFL) and Giovanni Ciriello, a principal investigator at the University of Lausanne (UNIL), declared that they have shown, for the first time, that mutated EZH2 affects not just individual genes, but entire chromatin domains. Inside the cell, DNA is tightly wrapped around proteins and packed in a complex, 3D structure that we call chromatin. 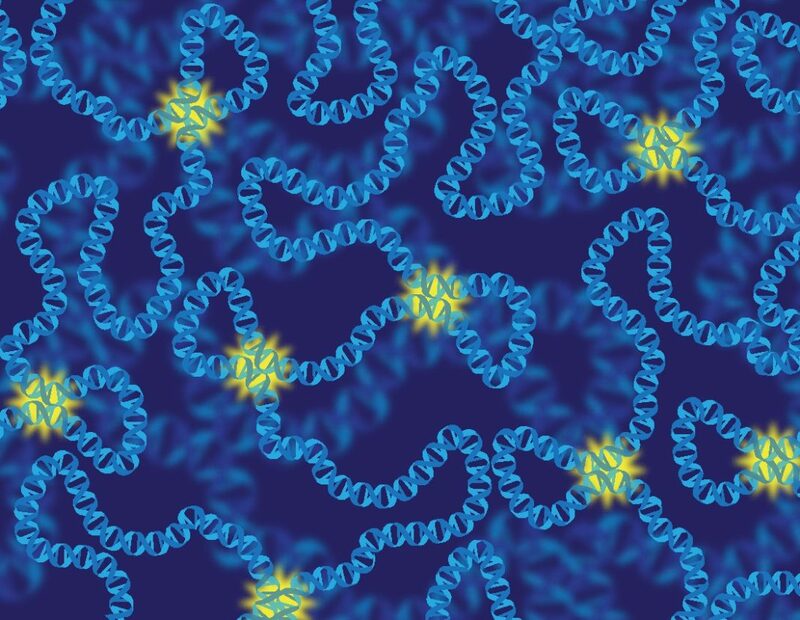 Chromatin not only protects our genetic material from damage, but also organizes the entire genome by regulating the expression of genes in three dimensions, unwinding them to be presented to the cell’s gene-expression machinery and then winding them back in. Inside the 3D chromatin structure are found TADs, which contain DNA sequences (thousands to millions of DNA bases) that physically interact with each other, suggesting that the genes in these domains may be working together. Discovered in 2012, the functions of TADs are not yet fully understood, but it is known that disrupting TADs disrupts gene regulation, and this can be a mechanism that cancer cells use to alter gene expression. In the current study, the researchers found that TADs were the genomic sites where EZH2 acted. Significantly, EZH2 did not appear to act randomly across the genome. The EPFL and UNIL scientists also found that the loss of multiple genes synergistically accelerated the development of the tumors. Moreover, when the researchers inhibited mutated EZH2 with a drug, all the functions were restored.